Over the past two decades, telebehavioral health care has expanded significantly and is now widely accepted as a legitimate option for providing care. This has been made possible in large part by the availability of high-quality, low-cost, user-friendly digital communication tools. Along with the advancement of these tools is the ever-growing acceptance of technology's presence in our lives; health care practitioners and patients have both shown a willingness to accept and even embrace technology if they see a benefit in terms of time saved and overall convenience. But with the expansion of these services, there also comes a need for specialized training. Along with the various forms of training currently available to support behavioral health care providers in general, there is a need for comprehensive training programs designed specifically for the social work profession. Telebehavioral health care offers a cost-effective model for increasing the availability and accessibility of mental health and substance abuse services, especially in rural, remote, and medically underserved areas. In addition to addressing access barriers related to location and transportation, this mode of care also facilitates access in cases where stigma might otherwise discourage a client from receiving services. Points of delivery for such care are diverse, including hospitals, emergency departments, clinics, offices, homes, nursing homes, schools, and correctional settings (Saeed, 2015). Numerous studies have found that telebehavioral health care is able to offer the same quality of care as that provided via in-person services; studies also indicate that clients are receptive to this type of service delivery. A 2013 report from the US Department of Health and Human Services notes: "Telebehavioral health may be one of the more successful applications of telehealth cross the spectrum of clinical services, as outcomes and patient acceptance for telebehavioral health are comparable to face-to-face visits." While the ubiquity of digital technology has led to increased comfort levels with various communication tools, these tools are still evolving, and they raise a host of new legal issues. As the legal landscape around digital technology continues to take shape, social workers need to be mindful of their responsibilities as well as the risks they incur when providing virtual services. For instance, digital technology removes geographical constraints, allowing social workers to deliver services across state lines. But this does not negate the need to remain compliant with licensing laws regarding eligibility to practice. Patient identification, informed consent, and privacy issues all become more complicated with the delivery of virtual services. Social workers need to be fully informed about the associated risks, and adequately trained to manage these risks. Furthermore, while technical competencies don't supersede clinical competencies in the delivery of telebehavioral health services, adequate technical skills and reliable tools are still essential for effective service delivery. A seemingly minor glitch, such as a poor audio connection, has the potential to compromise a patient encounter and lead to misunderstandings or miscommunication. Adequate training and preparation ensures that service providers are thoroughly equipped to deal with these situations, so they can minimize any negative impact on the patient. Much of the telebehavioral health care training currently available is provided as continuing education units, as standalone courses, or in the form of short webinars. Even though the content of these programs may be sound and reliable, this training is generally designed to accommodate a variety of clinicians and health care practitioners. Such training usually has not been developed to explicitly incorporate a social work perspective, and is therefore limited in its ability to address issues and challenges specific to social work practice. Alaska has long been at the forefront of developments in many areas of telehealth, so it comes as no surprise that the School of Social Work at the University of Alaska Anchorage offers a telebehavioral health care training course as part of their social work curriculum. Their MSW multidisciplinary course "Innovative Practices in Telehealth" provides an overview of telehealth, with an emphasis on telebehavioral health in Alaska. Developed in 2009, this course was designed by a multidisciplinary team from the university in partnership with the Alaska Native Tribal Health Consortium, and the Alaska Psychiatric Institute Recovery Center. Alaskans have higher rates of suicide and substance abuse than the national average, and the region's widely dispersed population presents a challenge for effective service delivery. The distribution of the population across remote and rural areas means that many people don't have access to behavioral health care services within their communities. The course offered by the University of Alaska Anchorage is part of a larger effort to provide telebehavioral health services that can effectively meet the population's needs. David Wilkerson, PhD, LCSW, is an assistant professor at the Indiana University School of Social Work at Indiana University-Purdue University Indianapolis (IUPUI). He is also an instructor and coordinator of the course development and design team with the online MSW direct program. According to Wilkerson, large-scale access to telebehavioral mental health and substance abuse health care cannot emerge without a properly trained workforce. As social workers comprise the largest group of mental health care providers in the United States, it's essential that they receive comprehensive training that recognizes and reflects the uniqueness of the social work profession. With the support of a $15,000 IUPUI Curriculum Enhancement Grant, the Indiana University School of Social Work is developing three new online courses in social work and telebehavioral health. Wilkerson is the principal investigator on the grant, and he explains that each course has a specific focus. The first course provides an overview on the delivery of behavioral health interventions that are mediated through technology. It addresses legal and ethics issues, and will also help social workers to assess when telebehavioral health services are appropriate for a client. Setting up behavioral care services has an administrative component, with the need for appropriate protocols, policies, and procedures to be established to guide service delivery and assess quality of care (Saeed); students will gain the skills required to deal with these responsibilities. The two remaining courses are designed to address individual and group-based interventions. For example, the course on group-based interventions will delve into issues such as how to develop delivery systems in a way that can increase client participation and retention and ultimately improve outcomes. "By offering a multisequence set of courses over a sustained period of time," Wilkerson explains, "we can prioritize the course content and determine the sequence in which it gets delivered, in order to best meet the needs of students." Beyond learning about how to deliver telebehavioral services, students will be in a better position to determine whether or not they want to deliver services in this manner, as they will have the opportunity to explore their own preferred style of helping and how well it fits with the delivery of care using technology. Wilkerson cites other benefits to this training format, such as the opportunity for social learning as students engage in conversations and share their experiences and perspectives. Students will be able to communicate with their peers, share meaningful exchanges, and draw on social work expertise as they grapple with issues over time. Going through the program within cohorts will allow the students to develop relationships which they can later draw on for support as they engage in their future social work practice. This level of training also has implications for policy contributions. As the technologies continue to develop and telebehavioral health care advances, new issues and challenges will inevitably arise. Wilkerson notes that the competency and legitimacy offered by a more comprehensive, multicourse, social work specific program supports social workers' ability to contribute to policy development and the establishment of best practices. In 2015 the Association of Social Work Boards (ASWB) International Technology Task Force released model regulatory standards for technology-mediated social work practice. 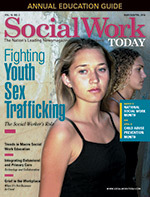 These standards state that social workers who provide electronic social work services should only provide such services "after engaging in appropriate education, study, training, consultation, and supervision from people who are competent in the use of this technology to provide social work services." Offering courses as part of the university social work curriculum supports the ASWB's objectives by providing specialized content with an explicit focus on social work practice. Graduate level courses are ideally suited for providing in-depth training in the various areas identified by the standards. Looking ahead, Wilkerson believes there is a call for social work educators to stake out a role in the provision of telebehavioral health care training. This is essential for ensuring that social workers who choose to provide technology mediated social work services are fully equipped to do so. Social work practice has always presented a number of ethical challenges and grey areas; the challenges and areas of concern are compounded when technology is being used to facilitate service delivery. Therefore, it's essential that the training provided be comprehensive and firmly grounded in a social work perspective. Regarding the new program at the Indiana University School of Social Work, Wilkerson says: "This type of education program provides an opportunity for the social work profession to develop a more powerful voice on telebehavioral health, and how to deliver services in a way that's consistent with social work ethics." Saeed, S. A. (2015). Telebehavioral health: Clinical applications, benefits, technology needs, and setup. North Carolina Medical Journal, 76(1), 25-26.